When the Windows operating system encounters a situation where it can't continue, or where continuing might lead to data corruption, it comes to a screeching halt and displays an incomprehensible error message on a screen with a blue background. This situation is referred to as "The Blue Screen of Death" (BSOD). What can cause the Blue Screen of Death? 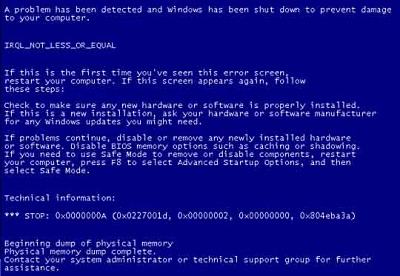 The most common cause of the BSOD is a memory or a storage device read or write error. It could be an inability to read memory or a storage device. It could be bad data retrieved from a memory or a storage device, or it could be a program or service attempting to read from or write to a location in memory or a storage device that it is not authorized to access. This indicates that Windows has detected a parity error in system memory. In other words, bad data was retrieved from a memory or a storage device. Parity refers to an error checking scheme where a bit in each byte is set to an 0 or 1 so that each byte has an even number of ones (or in the case of odd parity, an add number of ones). If the number of ones in a byte read from a memory or a storage device does not match with the parity scheme, it indicates an error. The error shown above indicates that the processor tried to execute an illegal or unknown instruction. If you're familiar with Windows virtual memory scheme, you know that the operating system is able to pretend like it has much more memory than the amount of installed RAM by using part of the hard disk as virtual memory. Blocks of data and program code are shifted in and out of virtual memory in block sizes called pages. The file on the hard disk that they are stored in is called the page file. The error shown above indicates that Windows encountered an error in an area of system RAM that was not paged into virtual memory.